Changwon in Gyeongsangnam-do, known as a beloved hideout for artists, is a romantic travel destination throbbing with artistic sensibility. The city is filled with a variety of attractions, including alleys adorned with beautiful flowers and trees, a charming mural village, heartwarming traditional markets, and more. Recently, the street of Changdong has been drawing an ever-increasing number of visitors with the installation of "Sangsang-gil." Literally meaning "Imaginary Road," it is a newly built tourist zone with the names of Korean celebrities and international tourists engraved on its sidewalk. Head off on a trip to Changwon this fall to explore this gorgeous city of artistic delights! Sangsang-gil road, the only street of its kind in the world, is filled with names of the general public. This street was made possibly by a special campaign launched by the Korea Tourism Organization. Millions of international applicants entered, among which 23,000 lucky winners were selected to have their names engraved on the road. Although scheduled for completion in October 2015, there was recently a grand opening ceremony. The road is expected to perform as a special attraction for visitors coming to the area. In particular, the winners of the campaign will be delighted to find their names just below their feet. Taking pictures as a keepsake of this special experience will add more fun in exploring Korea's southern region. ☞ Directions: 8 minute taxi ride from Masan Station. Chang-dong Art Village was created by redeveloping Chang-dong Street, a declining yet once thriving downtown of the old Masan city (now consolidated into Changwon City). As ateliers, cafes, and galleries took over the vacant stores, the empty town has been transformed into a street of art, characterized by its distinctly romantic ambience. 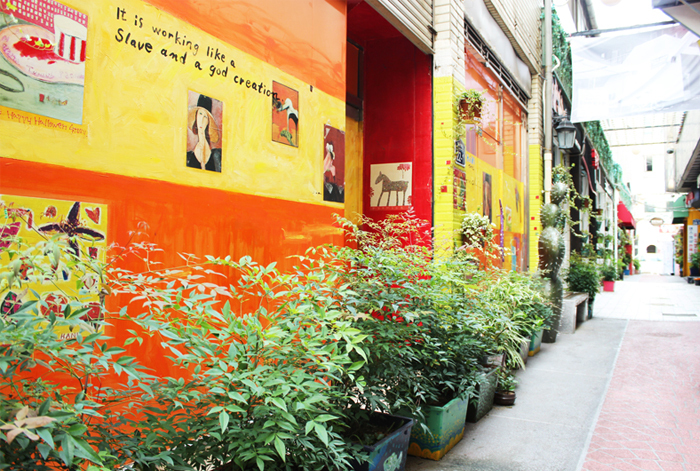 A great number of unique murals and popular photo spots hide behind every corner, offering a joyful experience of exploring the alleys. The Chang-dong Art Village Art Center, easily spottable during one's tour of the village, displays an array of artworks by international artists, and also provides tourist information. The center is open from 11:00 to 18:00, and is closed every Monday and on the day of Chuseok. ☞ Directions: 10-minute taxi ride from Masan Station. 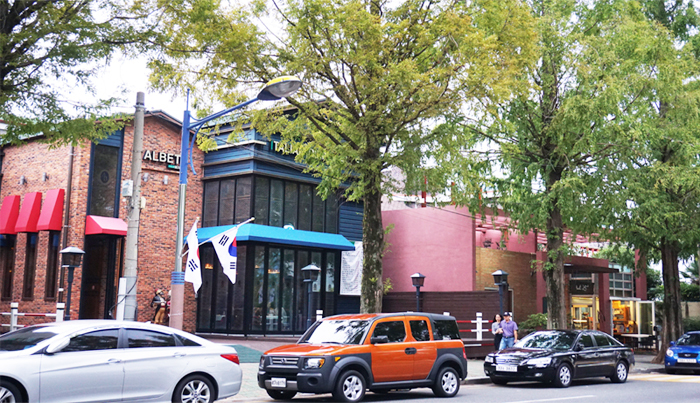 The quiet neighborhood of Yongji-dong is the new up-and-coming hot spot for Changwon residents to meet and gather, thanks to its metasequoia tree road. Dubbed as the "Garosu-gil of Changwon" (after the famous Sinsadong Garosu-gil in Seoul), the area is dotted with cozy coffee shops, galleries, and art shops that draw a constant stream of visitors, especially young people. The metasequoia-lined road and the revamped buildings give off an exotic vibe, for which it is an ideal place to take a leisurely stroll with take-out coffee in hand or enjoy tea-time on one of the cafe terraces. On weekends, a flea market is held here, adding to the fun of exploring the area. Gagopa Kkoburang-gil Mural Village can be reached by walking through the alleys leading down from Changwon City Museum. It is a small village, the walls of which are decorated with mural paintings illustrating the old landscape of Changwon, such as its sea and port, as well as other diverse themes like animals, flowers, pop art, and more. Some of the meaningful places in the village, including its 100-year-old well and the senior citizen center have been turned into photo zones for visitors to capture the colorful murals. Climb up the stairs flanked by these mural drawings to get a magnificent birds-eye view of Masan Port. The village is a must-visit destination in Changwon, but it is also a residential area for locals, so visitors are advised to look around quietly. ☞ Directions: 13-minute taxi ride from Masan Station. Changwon City Museum is an art museum dedicated to the internationally recognized artist Moon Shin (1923–1995), who spent a good part of his life in France. Moon is most well-known for his 25 meter-high stainless steel artwork on display at Olympic Park in Seoul. The art museum was completed after 14 years of construction under the guidance of the artist himself, who also designed the building. It is comprised of three exhibition halls housing around 290 works, including this artist-slash-founder's own sculptures and oil paintings that each display a great deal of artistry. In addition, the museum is situated on the hill overlooking Masan Bay, so visitors to the museum can also take in the great scenery. ☞ Directions: 12-minute taxi ride from Masan Station. The House of Changwon is the place to go if you want to experience Korean traditional culture. This hanok (traditional Korean house) complex was set up on a wide stretch of land around 200 years ago to preseve the time-honored houses and traditional culture. The complex consits of 14 buildings, which include a guesthouse, a main building, and an octagonal pavilion called palgakjeong. On display inside the buildings are farming tools that were once used by Koreans, and beeswax figures reenacting scenes from the Joseon dynasty, thereby offering visitors a chance to travel back in time. Popular among photographers for its well-kept garden and architectural beauty, the House of Changwon offers use free of charge for couples holding a traditional wedding here. ☞ Directions: 25-minute taxi ride from Masan Station. Or 8-minute taxi ride from Changwon Jungang Station. Connected to the alley of Changdong Art Village, Burim Market is Changwon's major traditional market in addition to being a famous wedding market. The market sells a diverse assorment of goods, such as clothes, fruits, and vegetables, but it is especially popular among customers who come to rent or purhcase tailored hanbok (traditional Korean dress) at affordable prices. In fact, you can often spot couples here searching for hanbok to wear to their upcoming wedding ceremonies. The market is also widely-known for its tasty Myeongmul tteok-bokki (spicy rice cakes), which is served on a plant stand and makes for a budget-priced, hearty meal. ☞ Directions: 9-minute taxi ride from Masan Station. Masan Fish Market is the largest of its kind in Korea with over 250 years of history. The market houses more than 1,200 stores selling fresh seafood caught in the waters surrounding Masan, Tongyeong, and Geoje. It is divided into several sections, each specializing in different items, such as salted seafood and dried fish. The most popular section is the one lined with hoetjip (raw fish restaurants), which is always bustling with people who come to taste fresh raw fish. This arcade-style market provides clean facilities and rest areas for visitors' convenience. In addition, Lotte Department Store is located right next to the market, which makes the area an ideal shopping destination. The annual Masan Fish Market Festival, held in the fall, draws a large number of visitors each year as it offers much to eat and enjoy. * This column was last updated in October 2015, and therefore information may differ from what is presented here. We advise you to check details from the official websites before visiting.